Capacities from 1 lb. to 100K lb. No need for additional signal conditioning or data acquisition system - direct measurement on your PC via USB. Our easy to use dynamic force measurement solution can be used for applications that require force information to be collected at a high data rate. Examples of such applications include failure strength testing, impact force measurements, vibration testing and material characterization. Most available dynamic force measurement systems use an accelerometer to make measurements. This requires the user to interpret the acceleration data (usually provided as G values) and estimate the actual force of impact. This complicates the task of the user who has to correctly estimate the mass of the "system" to arrive at the force values. Such dynamic force measurement systems fall under the umbrella of vibration measurement systems and can easily cost upwards of $8000 per channel. If you want to test impact forces from a metal-to-metal contact, like a steel ball falling on a metal or granite plate, the impact forces can be extremely high and duration of the contact time can be very small. For such applications you must use the DI-1000UHS-10KHz system which provides at least 10 KHz data capture rate (up to 50 KHz depending on the PC's CPU, memory, number of cores etc.). 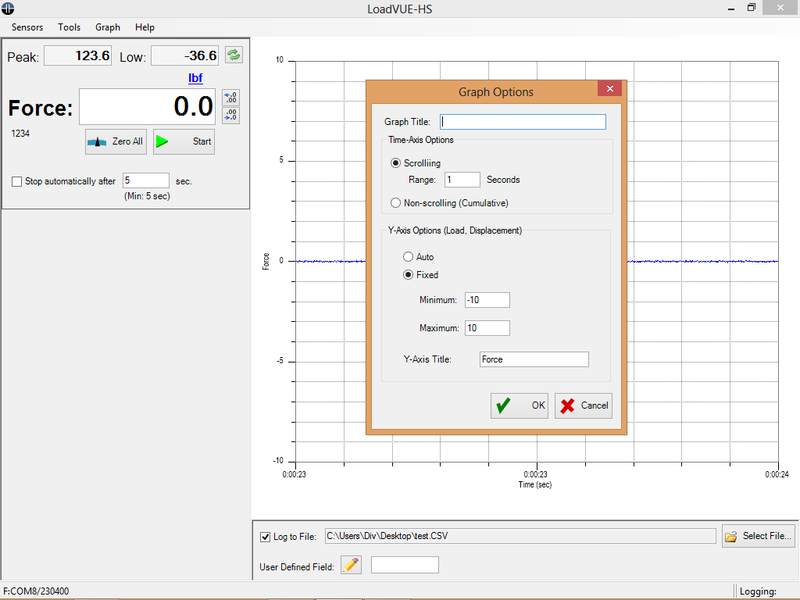 The LV-1000HS-1K software allows a user to display the applied force in real time and do a force vs. time plot, capture the peak and low forces that occur during the test, log the data to a comma separated file as well as add user defined data to the report as needed to append the file with useful identifiers for the test. The software also allows the user to define the time span of interest for the plot as well as overlay previously captured data sets in order to compare one test to another. 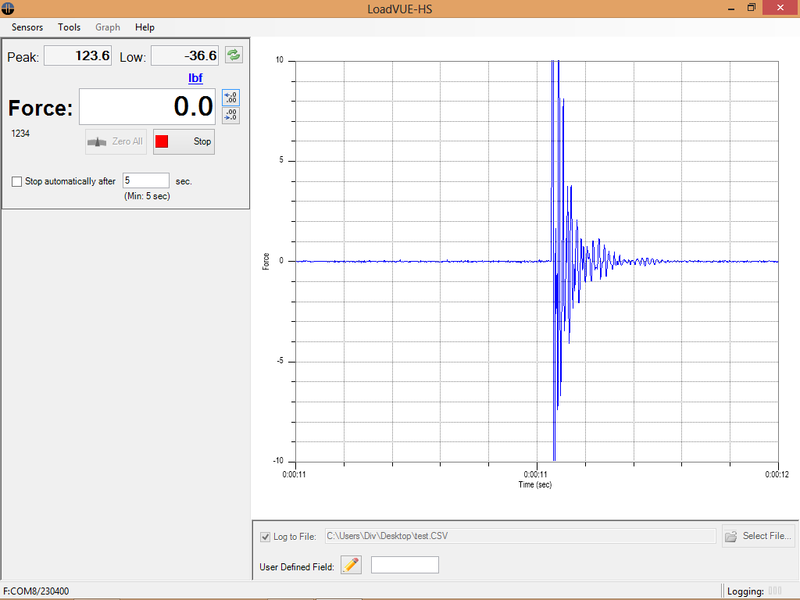 The LV-1000HS-10K software allows the user to "capture" the data during the test and then display the results on screen by opening the file. It cannot display the results in real-time unlike the LV-1000HS-1K software. For applications that need at least 10 data points in 1 millisecond, we recommend you select this higher speed 10 KHz version of the interface and software, which allows a user to capture data at up to 50 kHz. Here are two sample data files (in CSV format) captured during a one foot drop test of a plastic object. The data was captured at 50 kHz. Each file has over 150,000 points. Since Microsoft Excel can graph only 32,000 points, you may need to use other software like R, Matlab etc to graph this data. Our reasonably priced solution provides a very practical method of computing the actual measured forces as experienced by our sensor. The platform provided as part of our solution makes it easy for users to place test samples that will be subjected to the impact.